When it comes to building your financial future, you need someone with the knowledge to get you where you want to go. Someone who is experienced in financial planning and analysis. But life is too short to spend time with people who don’t make you smile. Visit our office, located on the edge of Keizer, in North Salem. 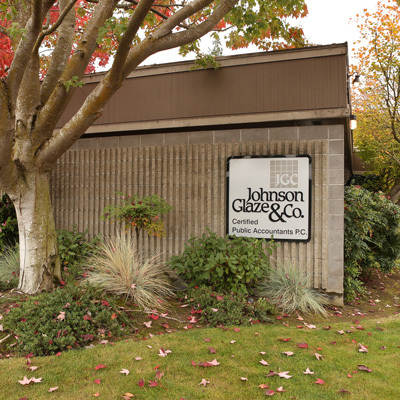 You’ll meet the CPAs and staff of Johnson Glaze & Co. and the JGC Wealth Management team. Our teamwork means you receive a complete picture of your assets, retirement plans, business or personal financial planning and tax planning. As a business owner, you’ll appreciate our integrated perspective to make the most of all aspects of your financial future, on the business side and the personal side. As an individual, you’ll welcome the personal attention and comprehensive services we offer to help you plan for a comfortable financial future. For your family, count on us to plan ahead with you, to guide your decisions about your estate and to help you leave the legacy you envision. The financial planners at JGC Wealth have the experience, qualifications and dedication to keep you moving on the right path. But we also enjoy a good laugh, and look forward to hearing about your life, your family, your goals and your dreams for the future. Use the button below to schedule. Or read through other areas of our website to learn more about our financial planning and analysis services. From managing your nest egg to helping you plan for retirement, you’ll appreciate our down-to-earth approach.